Have you ever tried to use Liber 777 (really use it!) to design and implement magical ritual? Can you read it without your glasses? Can you read it with your glasses? Can you pronounce the Hebrew names and words in 777 once you can read them? Can you find your way around its tables quickly and efficiently? (Can you answer yes to any of these questions?) Aleister Crowley's Liber 777 remains one of the most important occult references of the 20th Century, demonstrating the interrelationships of diverse philosophical, religious, mystical, and magical systems from around the world. One of Crowley's finest contributions to both practical and theoretical philosophy was this correlation of numerous world traditions, of East and West alike. Yet it has never been very handy for the practicing magician. Now, this extraordinary compilation by James A. Eshelman, titled 776 1/2, is designed exclusively to support the practice of ceremonial magick. According to its author, 776 1/2 is not quite 777. 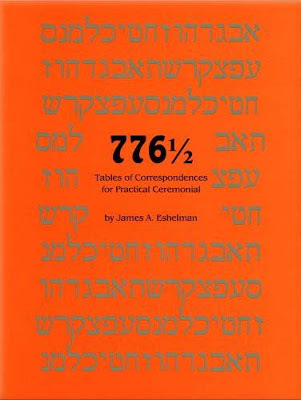 776 1/2 contains 182 tables of the most useful practical ceremonial information. Although much of this comes originally from 777, most of the tables have been supplemented and expanded. The Hebrew and other letters are large, clear, and readable. The columns have been reorganized into a more useful sequence. Additionally, almost every Hebrew word or Name in the entire work is also transliterated into English to assist the practitioner in pronunciation. Numerous typographical and other mistakes from 777 have been corrected. New tables have been added on such topics as: The Genii and Averse Spirits of the 22 Paths from Liber Arcanorum and Liber Carcerorum; the Thelemic, Scandinavian, Assyro-Babylonian, Celtic, Voudoun, and Santeria pantheons; Psychological Attributions of the 32 Paths; use of the Unicursal Hexagram; the Enochian alphabet and three models of its enumeration; and more. Practical correspondences of animals, plants, precious and semiprecious stones, magical weapons, incenses, magical powers and mystical states, and others have been expanded. And that's just the first half of the book! Supplementing these extensive lists is a new essay on Ritual Construction (which is also a partial study guide to Crowley's Magick in Theory & Practice) and ten sample magick rituals for such purposes as generating magical force, prosperity, obtaining angelic guardians, remapping your character patterns, the highest spiritual attainments, and The Thelemic Mass. This third revised edition expands the already popular 1995 edition with new tables and additional data. The instructional essays have been significantly expanded and updated to incorporate new teaching approaches. A new Appendix contains instructions for frequently used small rituals of banishing, invoking, and energizing including the never-before-published Liber Pleiades. In this new edition, 776 1/2 has grown so much, it should be renamed 776 3/4!